Went out and played the Shaftesbury Glen Golf Course with 3 of my local golfing buddies and we could not have asked for a better day! With temperatures in the mid to upper 80's it was a golfer's oasis. This was my first time ever playing this course and I was not let down! The course was in fantastic condition with wide fairways and elevated greens. From the moment I stepped on the first tee box I could tell we had stumbled across a hidden gem. 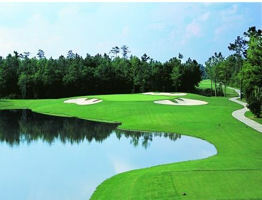 Tucked away in Conway, SC this course was approximately 30 minutes from North Myrtle Beach. My favorite part of the course was the elevated greens. The elevation required me to hit a club higher than I would normally use and the surrounding bunkers made a precision shot critical. Another thing we really liked was how nice and courteous the clubhouse staff was. They were extremely helpful and knowledgable when it came to the course so that made our day that much easier! I highly recommend adding Shaftesbury Glen Golf Course to your lists to play while vacationing in along the Grand Strand, or if you are local, you can make is a favorite stop. This was my first time ever playing this course and I was not let down! The course was in fantastic condition with wide fairways and elevated greens.